People of Sumatra are familiar with Parapat. It is one of the most recommended tourist destinations in North Sumatra. Not only it has the legendary “Batu Gantung”, it also offers a nature beauty like Binangalom Waterfall. It is the most iconic waterfall in North Sumatra. Why is that? It water falls straight into the lake! It is located adjacent to the famous Toba Lake. The name derives from the local village situated near to this lake. Since it is located near to the lake, you can enjoy both of them at the same time. Binangalom Waterfall means the “refreshing water”. No wonder, it is quite cool and refreshing when you come near to it. 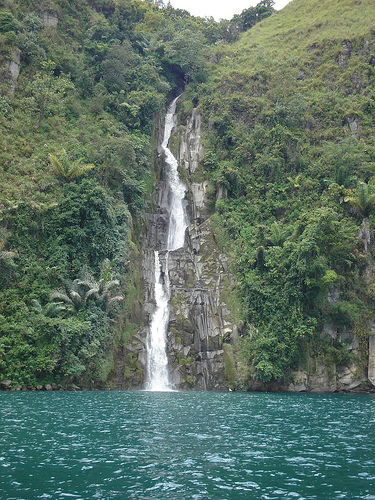 Also, the waterfall features a fresh weather and beautiful scenery. Do you wonder about the source of the water? Well, it comes from the river located near to the village. There are 7 levels of height and it directly falls into the Toba Lake. However, this tourist spot doesn’t have proper access. For many, it can be quite uncomfortable. The locals call this tourist attraction as Situmurun Waterfall. Thus, you shouldn’t be confused with it. The most famous thing to do is swimming. It is only for professional swimmers, though. If you come with kids, you must restrict them. The current is quite strong, so it is dangerous for beginners. It is better to sit and relax nearby. You may see some birds and fishes. What a peaceful activity! Getting closer to nature is the best remedy for anxiety. This is the place to refresh your mind and body. If you want to swim badly, you can wear a life vest. That means beginners can even swim in the lake safely. Once you enjoy swimming, you can do other activities. Binangalom Waterfall is suitable for a group activity and a family outing. What about a BBQ party? It is a good idea! However, you mustn’t litter. Make sure you keep the environment clean. Eating good foods while enjoying the beauty of the waterfall are irreplaceable. In a nutshell, Binangalom Waterfall offers numerous benefits. Not only it is unique, but it also offers clean and fresh water. You can feel the cool water and swim around. The rumor has it. If you take a shower under the waterfall, you are likely to find your soul mate sooner. Another benefit is the location. It is situated near to Balige and Parapat. The best time to visit the waterfall is during summer. The water is clean and the weather is nice. From Medan, you can directly head to Parapat. You only need to follow the main street. Once you reach Parapat, you may continue to Biningalom Village. It is about 2 hours from Parapat. In the village, you must use a boat to reach the waterfall. It usually takes an hour from the port. The water is quite calm. It will be a comfortable trip, for sure. Make sure you have prepared everything. These include snacks, bottled water, a life vest, etc.